With 17 million downloads since 2012, Dunkin’ Donuts’ mobile app is proving to be its jet fuel in the race for retail differentiation. 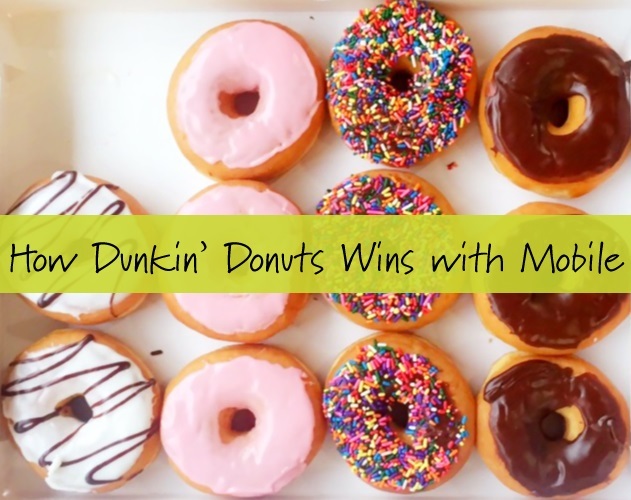 According to John Costello, Dunkin’ Brands president, Global Marketing and Innovation, “We are putting mobile first. It’s about lots of synergy. Mobile is now a platform and not just a device a consumer is using,” he said (qtd. in QSRweb). In the spirit of National Donut Day, we thought we’d take a look at how the Dunkin’ Donuts app is done right. With a whopping 43k reviews on GooglePlay averaging 4 stars, it’s no question the Dunkin’ app is well liked. The Dunkin’ mobile app is designed to make the customer’s experience run a little smoother. The app solves the problem well by allowing you to pay with the app through the virtual DD Card, offering good coupons and perks, and giving the impression that it knows you by adapting to your preferences. Monday it will make things even easier by introducing On-the-Go Ordering. Keeping the focus on the customer and not the competition, Dunkin’ is able to draw customers using the most effective technology for their experience. According to Paul Murray, Senior Manager Digital Marketing and Innovation, “Think strategy first, technology second […] It had to be one strategy that converges each day for our customers,” (qtd. in Loyalty360). For Dunkin’ Donuts, the mobile app was the best technology to invest in, but they didn’t stop there. They have evolved the app to integrate with social media and larger customer engagement campaigns to leverage its benefits in other technology platforms.